Your privacy and email are safe with us! Address : 353, Mani Mahal, Below PNB Bank, Kalbadevi Road, Mumbai - 400002, Maharashtra, India. Select Blouse Length 13" 14" 15" 16" 17" 18" 19" 20" 21" 22" 23" 24"
Select Sleeve Length 0" 1" 2" 3" 4" 5" 6" 7" 8" 9" 10" 11" 12" 13" 14" 15" 16" 17" 18" 19" 20" 21" 22" 23" 24" 25"
"You will be asked for Measurement details after you click on add to cart button". Select Around Waist 22" 24" 26" 28" 30" 32" 34" 36" 38" 40" 42" 44" 46"
Select Petticoat Length 32" 34" 36" 38" 40" 42" 44"
Garment measurement shown may have tolerance of 0.5 inch to 1 inch. Garment measurement shown may have tolerance. Bust: Measure the fullest part of your bust while keeping the measurement tape a bit loose. 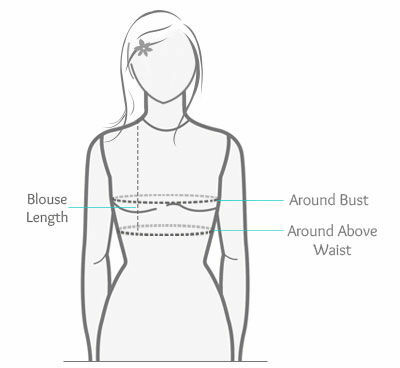 Around Above Waist: Measure it between the ribcage & above the navel or at 15 inches from the shoulder point. and genuiness of the product. The shades may vary slightly from the colors displayed on your screen. There might be slight color variation due to lightings & flash while photo shoot. The Products Shown on the website are not the part of Display at our Store. Blouse which is shown on model is only for modeling purpose. Every saree comes with unstitched blouse, if you need stitched blouse then we can provide to you as per your given measurement and stitching charges will be applicable in such case. Udnderskirt (Petticoat) will not come with saree but if you need then we can provide you.If you need shimmer petticoat then extra charges will be applicable.Heavy embroidered saree will come with unstitched blouse and that blouse will be one side embroidered. Embroidered part can be placed as per your choice whether you need it on front or back. If you need side opening, in such case embroidered part can be placed as per your choice. Ready to wear saree provides easy way to drape the saree. In such concept tailor will be stitched the saree on petticoat as per your given measurement. Ready to wear saree can be worn just like skirt without the bother of tucking, pleating, and adjusting the pallu length as they are already set in the center to make you feel more comfortable and easy in wearing. The blouse however is worn separately. Ready to wear saree are becoming very popular as they are easy to drape. Edging gives smooth end to the sarees. Fall are inner cotton lining used to protect the lower end of the sarees. Blouse will be stitched with cotton lining. If any net sarees comes with shimmer fabric then lining will be used of the same fabric instead of cotton. You can Select Necklines from the Neck Designs Section. Really pleased with the speed of delivery and the quality of sarees. Would definitely recommend Saree palace. Got what I wanted for my daughter on her birthday, you can buy this. Much appreciated !! Keep up the good work, sareespalace. I am very happy with your provided services. I was very happy with the service, delivery and the product. Thank you and keep up the good work. Subscibe for latest offers and deals! Saree Palace 353, Mani Mahal, Below PNB Bank, Kalbadevi Road, Mumbai - 400002, Maharashtra, India.